I got this book (free on Kindle) at the recommendation of Sarah Holman, who cited it as research material for her novel, "A Different Kind Of Courage." Ladies and gentlemen, this is not your typical dry-as-dust footnote material. Allen French shows that people did write interesting history books in the 1800's - early 1900's. 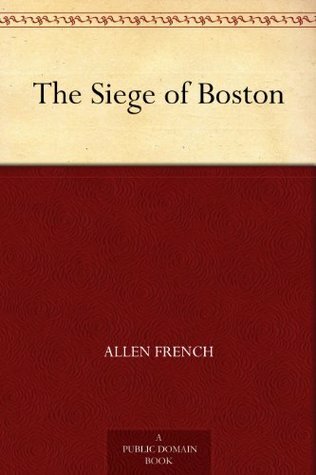 I gleaned a number of new facts and perspectives from "The Siege Of Boston," and found it absorbing from beginning to end. This is the best book I have read so far on the early Revolution. Allen French did a excellent job of presenting the facts without a lot of personal thoughts or slants to the story. He also did a fantastic job presenting both sides of this struggle. He showed not only what was going on on the American side, but also the BritishAllen French was the David McCullough of his time and I hope I am able to find more of his books to read. For anyone interested in reading about Revolutionary War history this is a must read. Totally enjoyed it and it was very well written. Allen French - Allen French (28 November 1870-1946) was a historian and children's book author who did major research on the battles of Lexington and Concord during the American Revolutionary War. He was a founding member and president of the Thoreau Society.Born in Boston, French attended Harvard University for his undergraduate education.Several of his children's books were illustrated by painter Andrew Wyeth.